An S&S 96" 3-5/8" big bore Hot Set Up Kit is an economical route to a larger displacement engine. 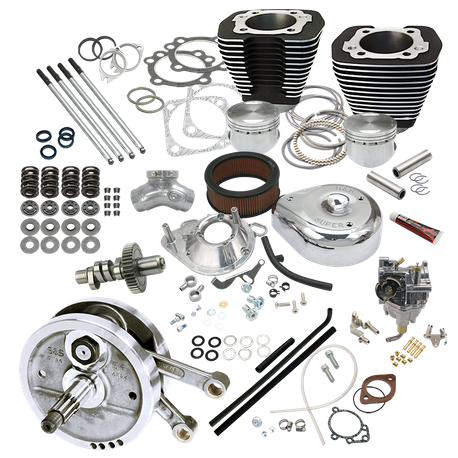 This kit contains nearly everying needed to take a stock 80" Harley-Davidson® Evolution® big twin engine up to 96" displacement and to get the most out of the added cubic inches. This kit includes S&S 3-5/8" bore aluminum Sidewinder cylinders and forged pistons, a 4-5/8" stroke dynamically balanced S&S flywheel assembly, complete with S&S heavy duty connecting rods and mainshafts, S&S 585 camshaft, S&S adjustable chromoly steel pushrods, S&S high lift valve springs, and an S&S Super E carburetor kit, complete with manifold and teardrop air cleaner.